The TI-2000 Time Manager integrated in the sleek housing of the TI-1750-III a clock, two 24-hour alarms and a stopwatch with 1/10 of one second resolution. The Time Manager was sold together with its own smoked-acrylic desk stand to do calculations, check time, job notes and appointments at the desk. Instead the usual 7-segment layout of the LC-Display to build the digits 0..9 the Time Manager added some segments and displays even a limited set of characters. The printed circuit board (PCB) of the Time Manager gives a rare combination of an Enhanced C-MOS calculator chip of the TP0456 architecture developed for scientific calculators like the TI-55-II and the small housing of the Basic Calculators. Please notice the shrinked housing of the Integrated Circuit (IC) compared to its standard size found e.g. in the LOGpit. It took another five years before the paper appointment pads were replaced with an electronic memory. Don't miss the Mini Data Bank. helps you manage your day...every day. On your desk at the office. The Time Manager CLOCK/CALCULATOR is so compact you'll never even notice it's there. Until you need it. The convenient acrylic stand makes it easy to see the time, date and appointments at a glance - and lets you calculate at the touch of a finger. Two alarms and the appointment pad can keep you on time and help you manage your day efficiently. At home by the phone. The Time Manager comes in handy for a variety of household chores. Time phone calls and cooking recipes. Set the alarms as reminders to pick up the kids and start dinner. Add up bills, balance the checkbook, total your purchases. This handy clock/calculator is as versatile as it is practical. Slip the Time Manager into your pocket, and you're off. The Time Manager CLOCK/CALCULATOR is a handy way to keep track of time and do on-the-spot calculations anytime, anywhere. Alpha-numeric prompting makes reseting to a new time zone easy. Time returnes to display automatically after ten minutes. Memory saves the number stored even in the time mode. Can be set to chime the time on the hour. Optional "beep" sound indicates positive key contact. Easy-to-read liquid crystal display shows up to eight digits, plus the time, date and day of week, alarm indicators, a P.M. indicator, and a chime indicator. 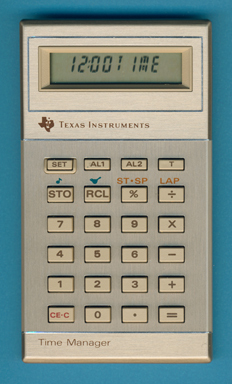 © Texas Instruments Incorporated, 1982. © Joerg Woerner, June 5, 2005. No reprints without written permission.